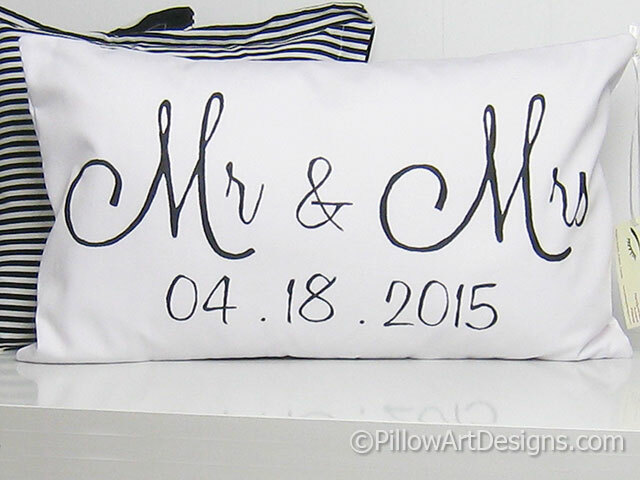 A simple but pretty and personalized engagement, wedding or anniversary pillow, Mr and Mrs with the special date below. 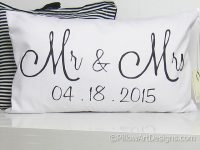 Hand painted using non toxic black fabric paint, will not wash off, flake or rub off. Size is 12 inches X 18 inches (approx. ), down feather insert is included. Outer fabric is white cotton twill. Fully lined with white cotton polyester, giving the cover a nice fit and finish. Handmade and hand painted by me. To order, simply add to cart and purchase this item, remember to send me an email here with the date you would like me to paint on the front.